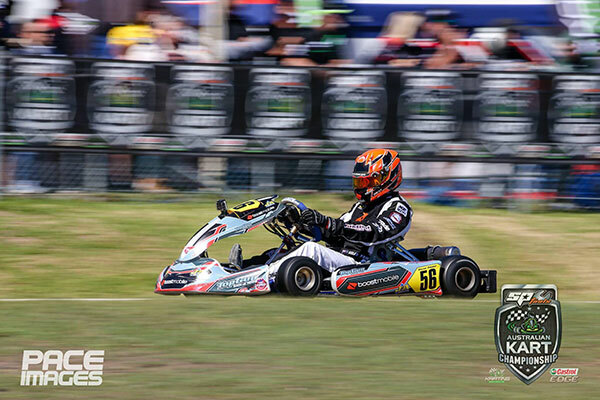 Top Gun Driver Training took a team of nineteen drivers across eight different classes to the second round of the Australian Kart Championship at the Newcastle Kart Club over the weekend. With pouring rain one day and sunny conditions the next the team were in for a tough weekend’s racing with TAG senior driver Reece Cohen stealing the show for the team. Top Gun Driver Training had seven participants in TAG Senior and Reece Cohen took the team’s first win of the championship in convincing fashion. Cohen was as low as fourth in the early stages but made his way to the front before half race distance and never looked back taking the win by over two seconds. Cody Brewcynski the current state champion was the next best of the driver’s just missing the podium in position four after being as low as sixth in the final. Toby Webb come home inside the top ten in position ten in a solid result with Taylor Hazard and Jayden Jin coming in just behind him in position eleven and twelve. Sasha Stevanovic and Alex Rinaldi both came home outside the top twenty in positions twenty-two and twenty-six respectively. KA4 Junior Light and Cadet 9 had one representative in each class with Harry Mitchell in KA4 Junior and Oceane Colangelo is Cadet 9. Mitchell after the opening lap was outside the top ten in position twelve but drove his heart out to fight back well into the top ten and finish in the top five in position five. Colangelo was outside the top twenty in the early stages before also mounting a fight back through the field coming home just inside the top fifteen in position fifteen in another good fight back for the team. In the premier senior classes X30 light and KZ2 Gearbox Top Gun Driver Training had three drivers with X30 driver Jayden Jin and KZ2 Gearbox drivers Zac Zamprogno and Aron Shields. Jin was in a tough battle all race long around the back end of the top fifteen in an ultra-competitive X30 class with quality drivers spread all throughout the field. Jin just missed out on a top fifteen finish in position sixteen in a hard-fought race. Zamprogno had a great start to the final running fourth inside the top five with Aron Shields running inside the top fifteen. As the final went on both drivers lost slight ground but still came home in strong positions with Zomprogno coming home just outside the top ten in seventh and Shields in position sixteen. In KA2 Junior both Top Gun Driver Training drivers Bailey Hazard and Annabelle Rolfo had hopeful top ten finishes for the final. Both drivers were outside the top fifteen at stages in the final with Hazard charging his way into the top ten with a charging fast finishing final result of position seven in the final. Rolfo gradually moved forward over the final coming home inside the top fifteen just missing the top ten in position thirteen in another strong fightback. 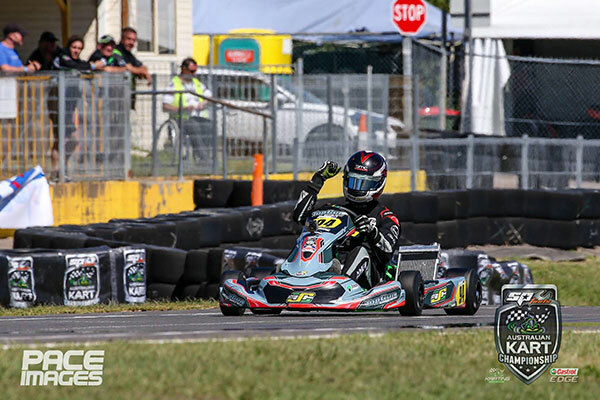 Cadet 12 had an oversubscribed field of near seventy karters trying to make the all important final and take out the win with three of them being Top Gun Drivers Marshall Atayan, Macka Hazard and Logan Eveleigh. Atayan and Hazard both made the final races and had strong races with Atayan and Hazard both battling around the edge of the top ten. Atayan just missed the top ten coming home in a respectable position eleven while Hazard was involved in an incident in the final few laps dropping from just outside the top ten down to position nineteen for the finish. Eveleigh unfortunately missed the Cadet 12 final after bad luck over the weekend coming home in forty second on points. KA3 Senior was the final class and with another oversubscribed field all three drivers Kurtis Read, Oscar Priest and Keelan Edwards all made the final field. Read was the best of the three battle inside the top ten throughout the final in a super strong field. Read came home inside the top ten in position nine with Priest coming home inside the top fifteen in position fourteen in a disappointing weekend by his standards. Keelan Edwards also had bad luck throughout the weekend and came home in position twenty-seven in the final. Top Gun Driver Training Owner Troy Hunt was happy with results of the weekend and . “What a win by Reece, that was a tough race and he didn’t have it all his own way but he showed his class” noted Hunt. “We had some great fight backs in the final by a few drivers but we also have work to do at the next round so we will press on to Monarto”. Top Gun Driver Training will next be at the track for the next round of the Australian Rotax Pro Tour.